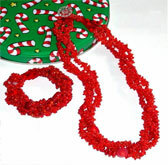 Seed beads are stitched into crinkle edged bands and accented by an eclectic mix of coral beads. Both the necklace & bracelet begin with square stitched cube bead end pieces which keep the strands twisted or separate, as you wish. Note: bracelet needs to be 1 inch oversize to allow for twisting.